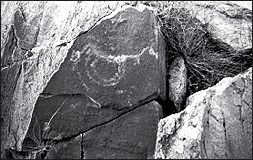 Discovered just after the Yinshan rock art were those at Wulanchabu to the north of Yinshan. After the investigation of Yinshan, I again made a study of rock art of Wulanchabu. It is dry grassland crossed by many ridges and dotted with many lakes and ponds. 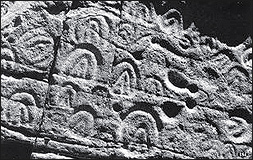 The drawings are chiseled, Scraped or simply incised on the plane surface of rocks, hilly lands or the giant stone blocks. Even those that look blurred and vague under ordinary conditions, can appear wonderfully clear when sunlight falls on them horizontally, and when immediately after the wash of rain. The subjects of the drawings are rich and varied. Some of them show the various kinds of birds and animals. Among them we can know that the Wulanchabu rock art was made after the beginning of the age of husbandry, since a large number of them are depictions of domesticated animals and the pasturing of them, newly born and young animals and the caressing, herding and feeding of them as well as the suckling of the young by the mother animals. These drawings show the transition from the hunting to the husbandry age, reflecting the change in the life of the people who turned to raising animals that they got by hunting formerly and how they loved their domesticated animals, and how much they wished that the animals would breed and multiply. The rock art show that the people at the time had successfully domesticated and raised eight animals. They are the dog, ox, horse, goat, sheep, pig, two-humped camel and donkey. They had even domesticated the hare and red deer. Nevertheless the pictures of these animals are concrete evidences for studying the early history and development of the domesticated of wild animals. I made my way to Xialekou northeast of Bailing Monastery in Wulanchabu, where the grasslands extend to the horizon under a blue sky and undulating ridges wind through the wilderness topped by rocks, some standing, some lying. Many of these bear images of animals like fantastic paper cuts, some executed realistically, but mostly doubled up, overlapping, sketchily indicated or deformed, most imaginatively conceived. Mixed in with these are scenes of hunting, cattle tending and dancing, and hoof prints similar to those discovered in Mongolia and Siberia. Scholars have suggested that these are related to the cult of motherhood and female sexuality. This artistic style shows that the idea of beauty had also changed. In the age of hunting, hugeness, great strength and great fecundity were considered beauties, and so the physical impressiveness of animals was emphasized in the period, but upon entering the age of husbandry, following the improvement of the material life of man, his idea of animals was also changed, and he was no longer satisfied with external form only. To a certain extent, his interest turned to inward intellectual loftiness. Simplicity, extraordinariness band together patternization was considered beauties. The purpose behind the drawing of animals changed gradually from worship to enjoyment and practical usefulness. It is very obvious that symbolized figures are convenient for recording social and production activities. 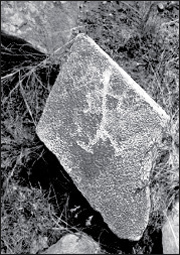 The later Chinese pictographic characters were developed from the symbolized rock art.